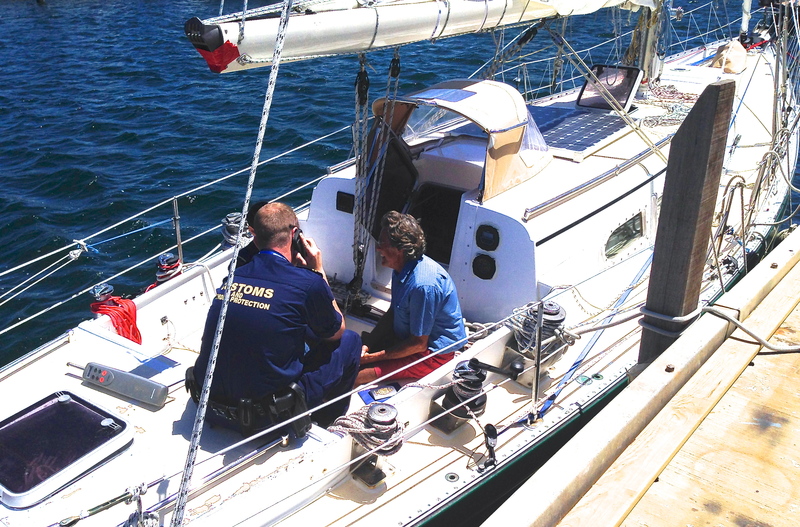 Glenn arrived safely at Fremantle, WA at approximately 11 am local time. He was greeted by a group of Fremantle Sailing Club members including the Commodore and Harbour Master, his good friend Alek and his wife Maryanne, ham radio friend Ted, and a group of well wishers. In a brief phone call from the wharf, Glenn said it was a very emotional occasion and once again he was shown the very best of mankind. I’ll post a few photos as they become available. Thank you all for the outpouring of well wishes and support. Great news Glen, Have a good rest!! Great to hear you’re back on land, mate and that you’re there too Marylou. Claire and I send our love. Hugs and an exceptional bottle of wine here when you get home! What a day it was. We all simply collapsed with exhaustion at the end of it. My god, that man can hug! Glenn and MaryLou, we are so happy Glenn has made it safely into port. We have followed you from day 1 and shared every up and down. Best wishes from the Middle Kingdom. Glad you’re safely ashore! What an adventure! So glad Glenn is safe and sound. Have been following the journey and loved it all. Congratulations Glenn we are glad to know you and WW II are now in the safety of the harbour. Well done!! Great news you made it, Will tip a beer to you. Welcome back to dry land Glenn. Congrats on an incredible journey!!!!! Absolutely amazing and impressive. You are safe and will get back with all of your loved ones. We have been holding our breath and can now breathe easy that you have made it safely to Fremantle. Of course we never had any doubt you could do it Glenn. You are an amazing sailor and always were concerned with safety which is the only way to be on the ocean. We are so proud of your accomplishments. We will be looking forward to further posts and what ever decisions you make our hearts are with you. MaryLou you must be so relieved that the love of your life is safe. Fantastic Glenn – so glad that you are safe and sound. You should be very proud of your achievement. All our best wishes to you and MaryLou and the girls. Eric and Anne. Thank you so much for sharing this emotional passage with us. This news of Glenn’s landing is such a milestone, a positive one. We are still out here eh? Please keep sharing. Bump. Thanks Glenn. The Admiral has been reading along with me. She wants to know what you’re going to do, call it a day, or fix and finish? God Bless! Thanks MaryLou. Time to stock up on some Fosters larger! Stay thirsty my friend. I am glad to see that you made it back to Australia safe and sound. What an adventure! Good to see he’s in. I’m in Sydney 3000 miles away but if he needs any help from this end of town please contact me. I have sailing friends in Fremantle and Perth too but it seems he’s organised over there. If he gets a local cell phone SIM, please send me the number and I’ll give him mine. It is heart-wrenching, but we are so glad Glenn is safe. We thank you, MaryLou and him, for taking us along via the daily emails on this amazing voyage. This was a truly incredible adventure. Congrats on safely arriving in Freemantle. Will anxiously await for your story and pictures. Thanks to Mary Lou for forwarding your story. Huzzah! And hurray! And Wooo Hooo!i champagne! Or the local beers! So glad to know you hit shore safely, Glenn, on your own terms, in charge of the situation just as much as when you started. The experience, the insights, the lessons you’ve shared have all been so much more than simply about a man trying to get from point A to point B the hard way. Thanks for humanizing this superhuman effort in all your great posts. The journey continues. Thank you for the great news. Whew. What a day! Thinking of you all.